Jon Godden (nee Winsome Ruth Key Godden). Photo from profile page at Curtis Brown Agency. Real name: Winsome Ruth Key Godden. Please don't combine this author with her sister Rumer Godden. 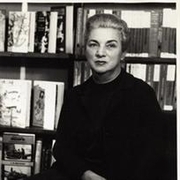 Sister of the novelist Rumer Godden. They also co-wrote a few books together. Jon Godden is currently considered a "single author." If one or more works are by a distinct, homonymous authors, go ahead and split the author. Jon Godden is composed of 1 name.